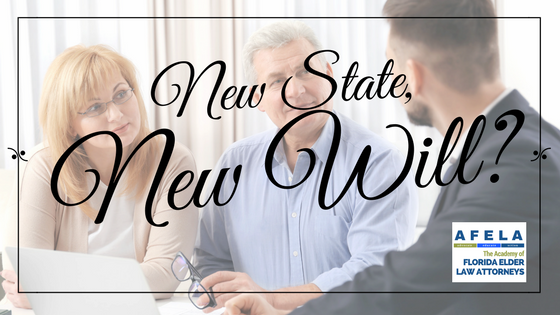 Wills and Trusts Attorney- New State, New Will? | Kathleen Flammia, P.A. Written by Erica R. Berger-Hausthor, Esq. Reviewed by Carolyn Landon, Esq. 1. I moved to Florida but I kept my apartment in New York. 2. I had a taxable estate in my old home state. 3. I did a Power of Attorney two years ago. 4. I moved to Florida, but my family and friends still live in Massachusetts. 5. I lost my original Will in the move. 6. I never had a Will, Trust, Power of Attorney, or any other documents when I lived in Illinois and I don’t have one now. We are here to make this part of moving the least stressful. After you take a breath and put your feet up for a bit, spend some time with an Elder Law attorney to go over your Estate Planning documents.